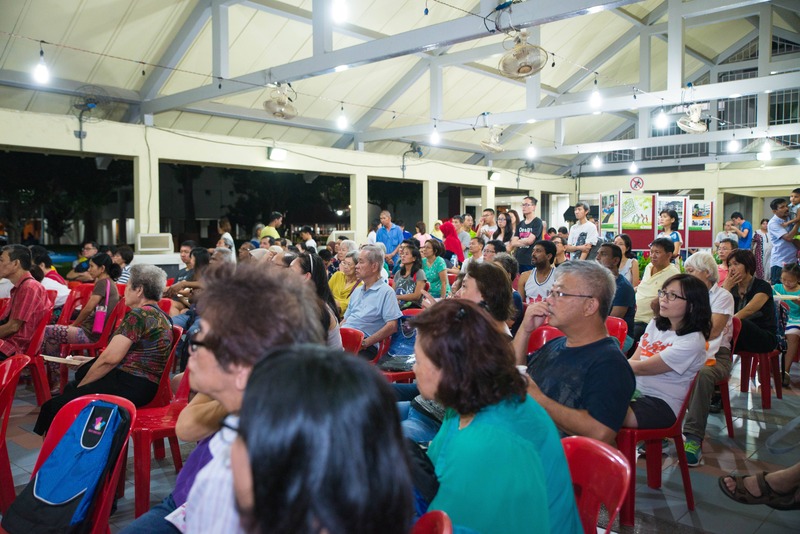 Over 500 residents from Blocks 812-832, 828A & 830A participated in the Neighbourhood Renewal Programme (NRP) Consensus Gathering on Sunday, 30 October 2016. 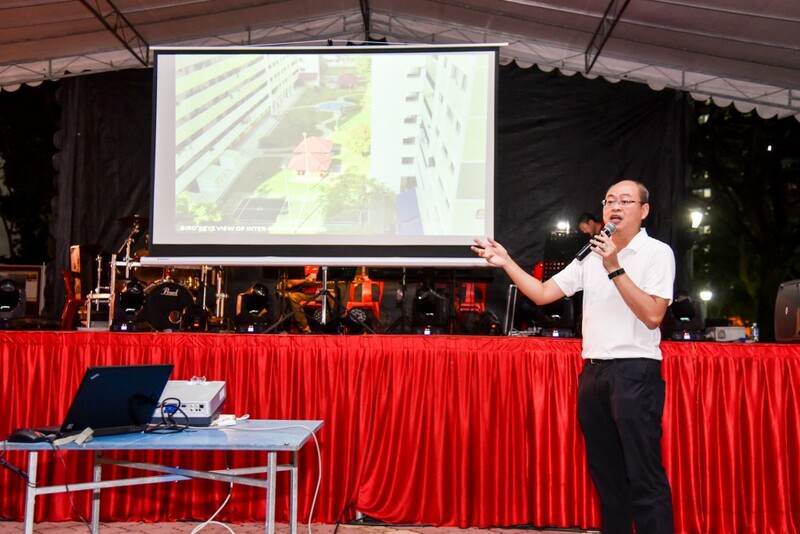 During the event, MP for Chua Chu Kang GRC (Nanyang), Mr Yee Chia Hsing shared with the residents about the highlights of the NRP. 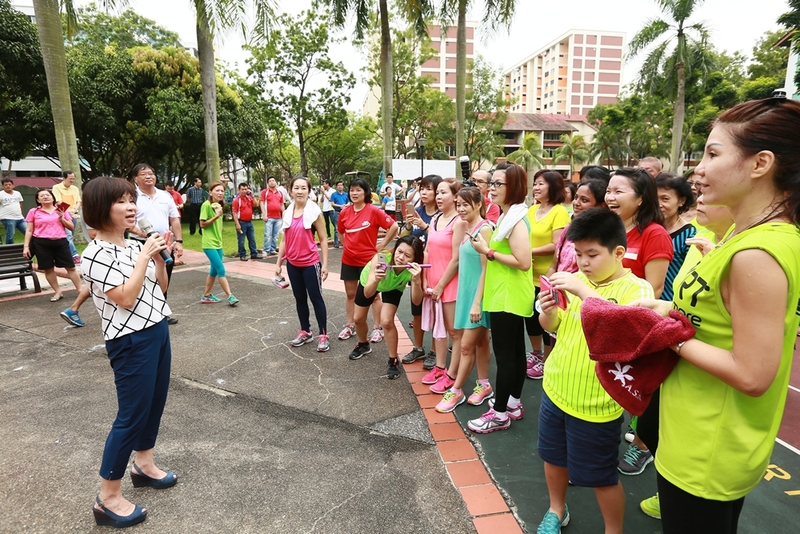 A 400m jogging track in Jurong West Park will be built to encourage our residents to cultivate an active and healthy lifestyle. In addition, the ground of the hardcourt in the park will be levelled off to reduce steps. This will help improve accessibility and provide greater convenience for our residents, especially the elderly and wheelchair users. We are elated to see our residents’ strong support for the NRP. 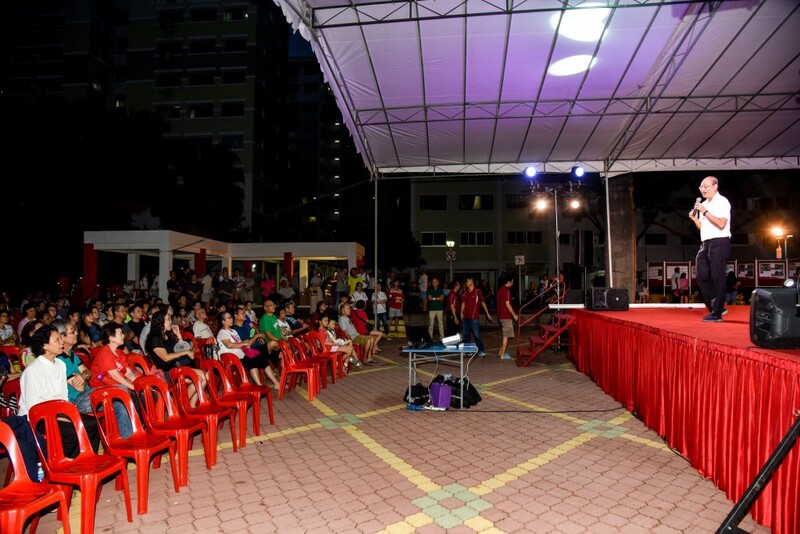 It was truly an enjoyable evening for the residents as the seats are all filled up for the getai performance which we have specially prepared. 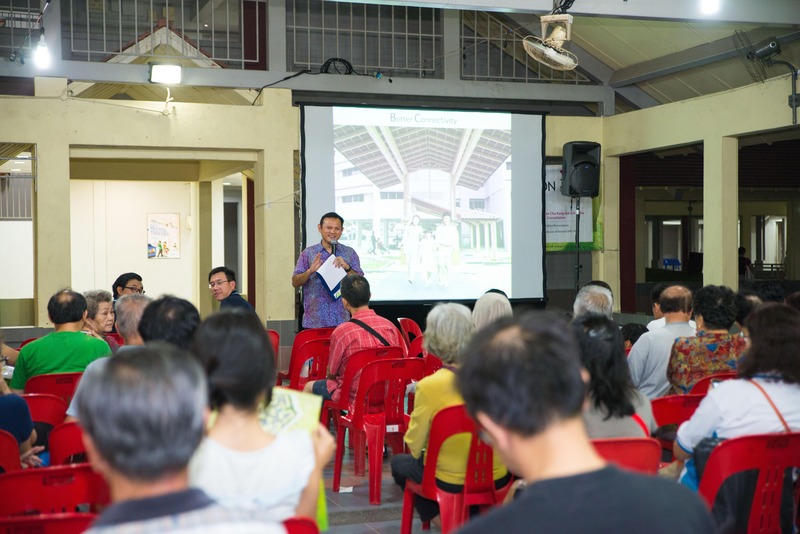 For residents who were unable to attend the Consensus Gathering, you may still send your support or feedback to the Town Council by emailing to info@ccktc.org.sg. 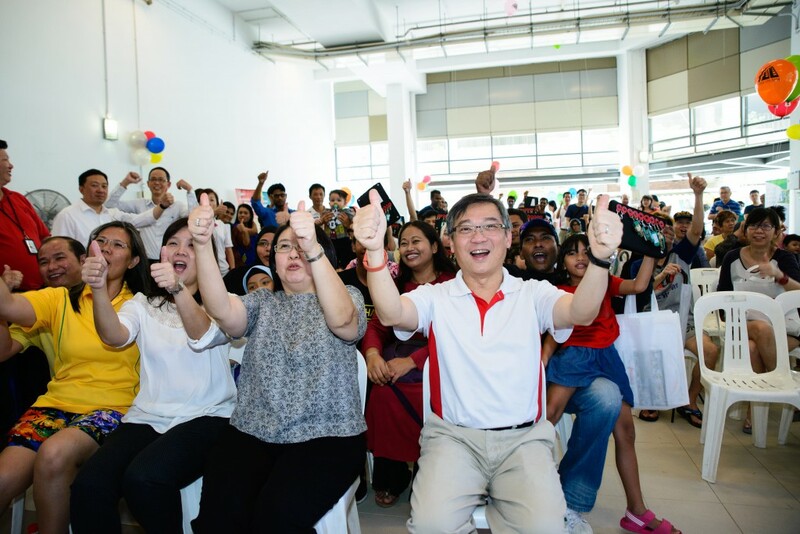 We are glad to see over 200 residents at the Family Hub @ Hong Kah North – Ground Breaking Ceremony on Sunday, 30 October 2016. 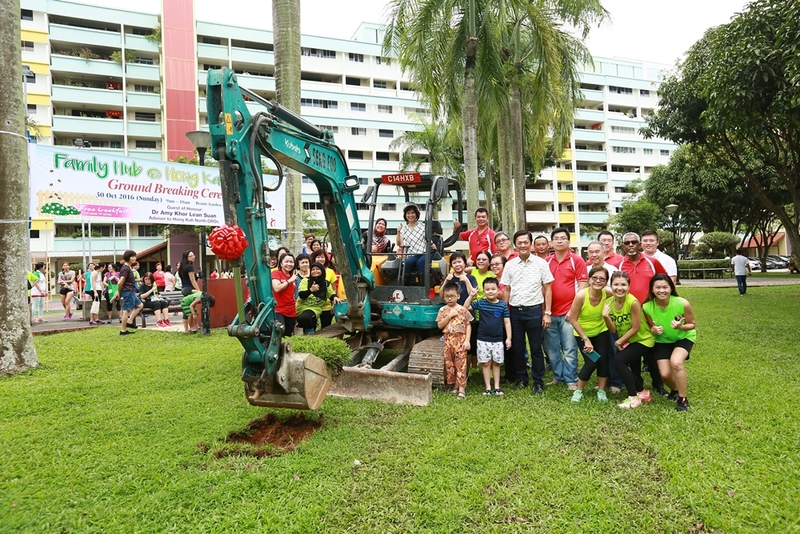 Dr Amy Khor Lean Suan, Senior Minister of State, Ministry of Health and Ministry of the Environment and Water Resources, MP for Hong Kah North and Vice-Chairman of Chua Chu Kang Town Council officiated the ceremony in a unique way by using the excavator. Hong Kah North residents can now look forward to a revitalised neighbourhood with the construction of outdoor amphitheater, hardcourt, pavilions, playground and fitness corners near Block 317 Bukit Batok St 32 (Open Plaza) and Block 350 Bukit Batok St 34 (Beauty Garden) under the Large-Scale Town-Wide project. 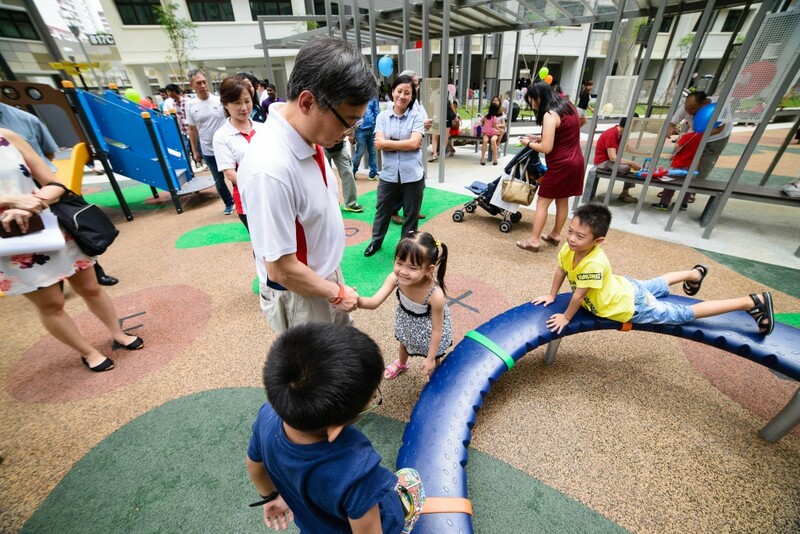 The project is also in line with our vision of making Hong Kah North a vibrant family hub for all residents. We cordially invite all residents to join us at the Family Hub @ Hong Kah North – Ground Breaking Ceremony on Sunday, 30 October 2016, 9am at Block 350 Bukit Batok St 34. 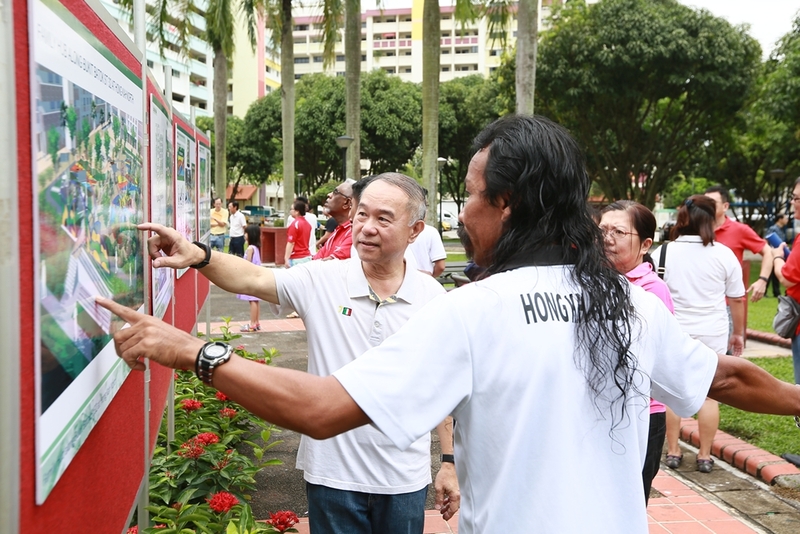 The neighbourhood will be revitalised with the construction of outdoor amphitheater, hardcourt, pavilions, playground and fitness corners near Block 317 Bukit Batok St 32 (Open Plaza) and Block 350 Bukit Batok St 34 (Beauty Garden) under the Large-Scale Town-Wide project. 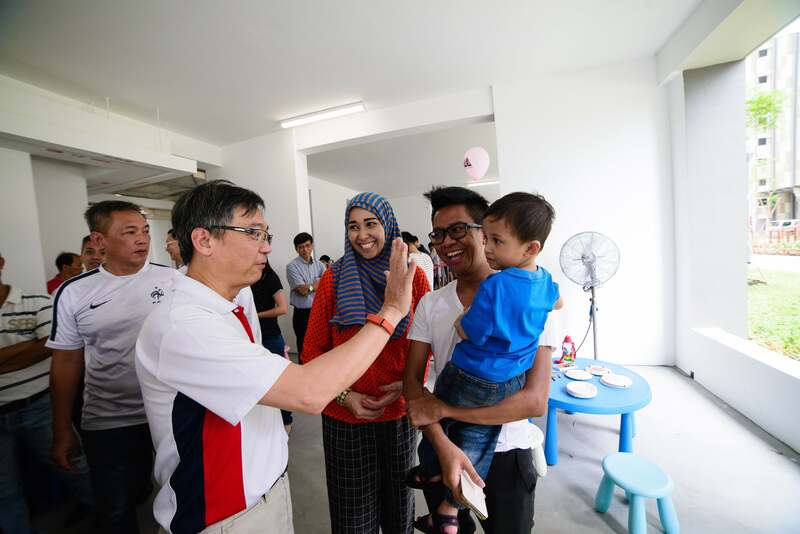 The project is also in line with our vision of making Hong Kah North a vibrant family hub for all residents. 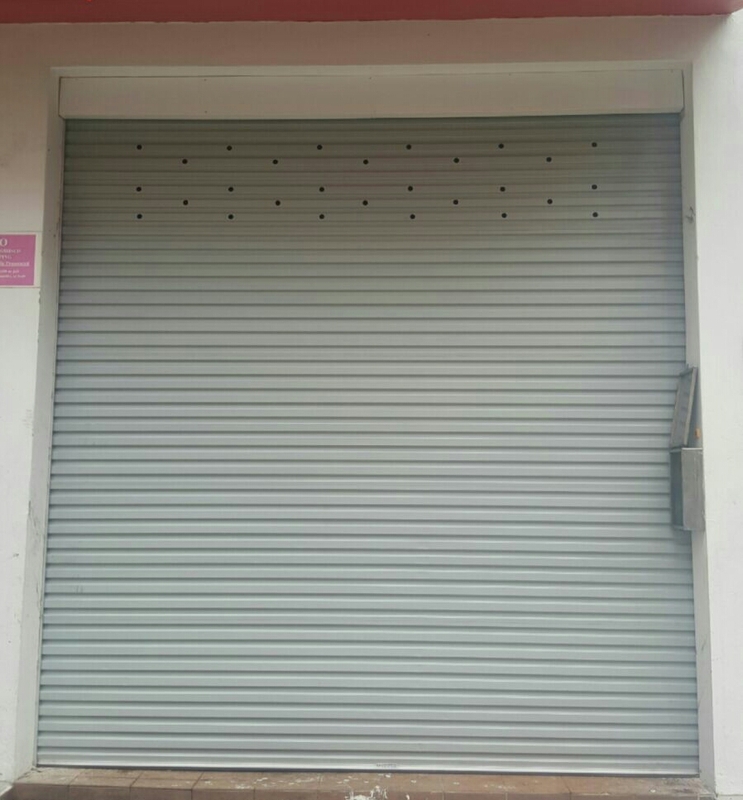 We are pleased to inform you that the central refuse chute is in working order and the roller shutter for the central refuse chute has been repaired. You can continue to dispose your waste into the refuse chute hoppers. We would like to urge residents to refrain from discarding lighted materials (such as cigarette butts and incense sticks) and combustible items into the central refuse chute. For further clarifications, please do not hesitate to contact us at Tel: 6569 0388 or email us at Email: info@ccktc.org.sg. Kami bersukacita untuk memberitahu anda bahawa pelongsor sampah pusat adalah dalam keadaan baik dan pintu gulung pelongsor sampah pusat itu telah dibaiki. Anda boleh terus membuang bahan buangan anda ke dalam corong tuang pelongsor sampah. Kami ingin mengingatkan para penduduk supaya tidak membuang bahan-bahan yang menyala (seperti puntung rokok dan setanggi) dan barang-barang yang mudah terbakar ke dalam pelongsor sampah pusat. 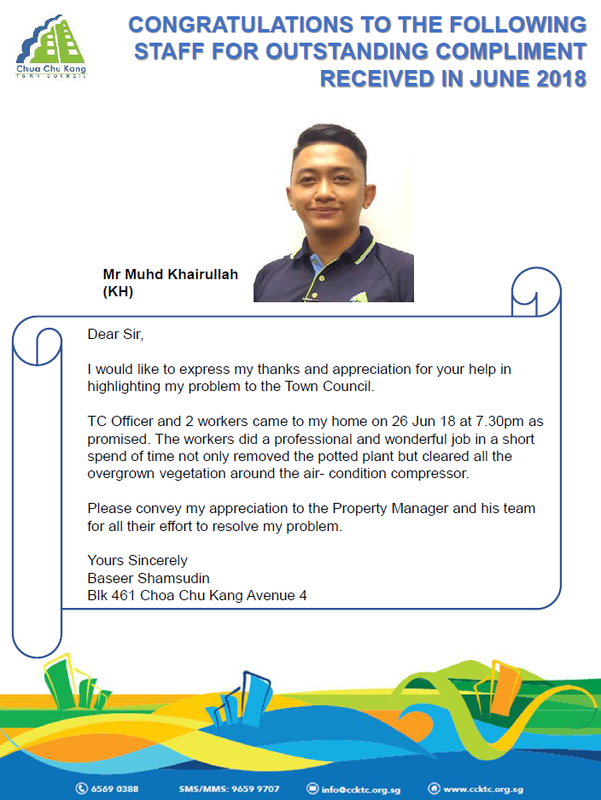 Untuk keterangan lanjut, sila hubungi kami di Tel: 6569 0388 atau menghantar e-mel kepada kami di Email: info@ccktc.org.sg. மத்திய குப்பைத்தொட்டி சீராக வேலை செய்வதையும், மத்திய குப்பைத்தொட்டியின் உருட்டுக்கதவு பழுது பார்க்கப்பட்டுள்ளதையும் மகிழ்ச்சியுடன் தெரிவித்துக் கொள்கிறோம். மத்திய குப்பைத்தொட்டியில் நீங்கள் தொடர்ந்து குப்பைகளைப் போடலாம். நெருப்பு பற்றவைக்கப்பட்ட பொருட்களையும் (சிகரெட் நுனிகள், ஊதுவத்திகள் போன்றவை), தீப்பிடிக்கக்கூடிய பொருட்களையும் மத்திய குப்பைத்தொட்டிக்குள் போடுவதைத் தவிர்க்குமாறு குடியிருப்பாளர்களிடம் வலியுறுத்த விரும்புகிறோம். மேல்விவரங்களுக்கு, அன்புகூர்ந்து 6569 0388 என்ற தொலைபேசி எண்ணில் அல்லது info@ccktc.org.sg என்ற மின்னஞ்சலில் எங்களுடன் தயங்காமல் தொடர்பு கொள்ளுங்கள். 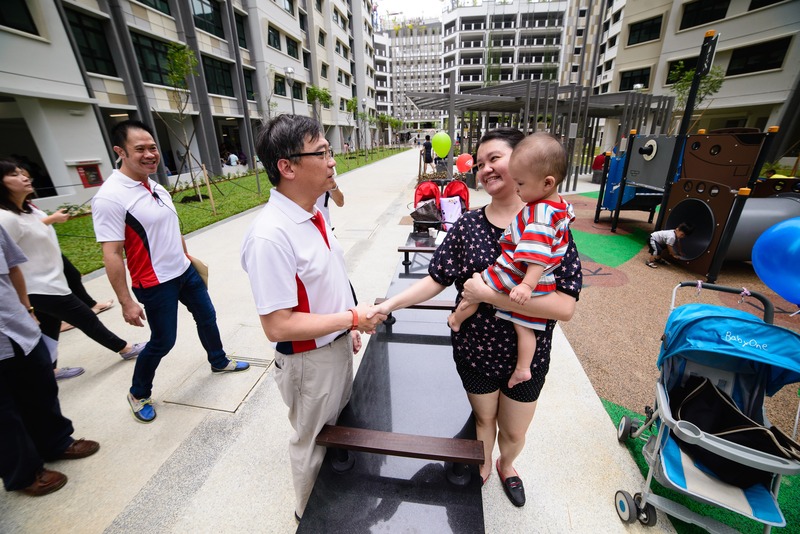 Let’s welcome our Sunshine Gardens’ residents to Chua Chu Kang Town! 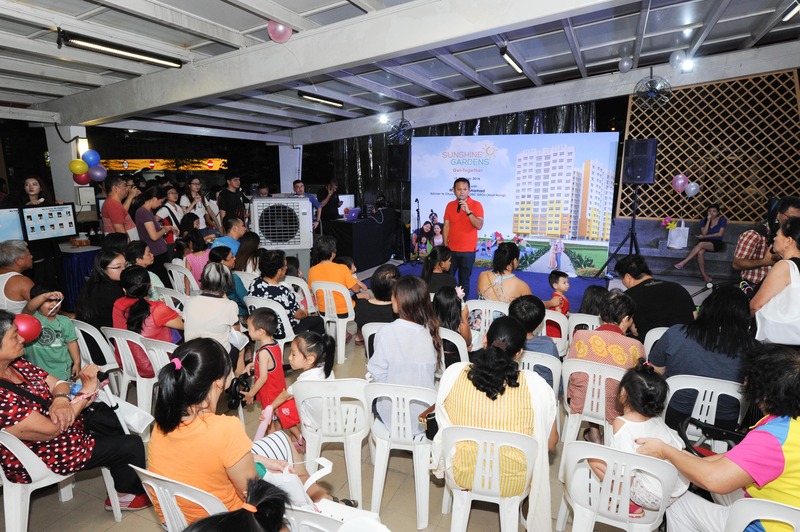 Over 250 residents from Sunshine Gardens attended the Sunshine Gardens Welcome Party on Saturday, 15 October 2016. 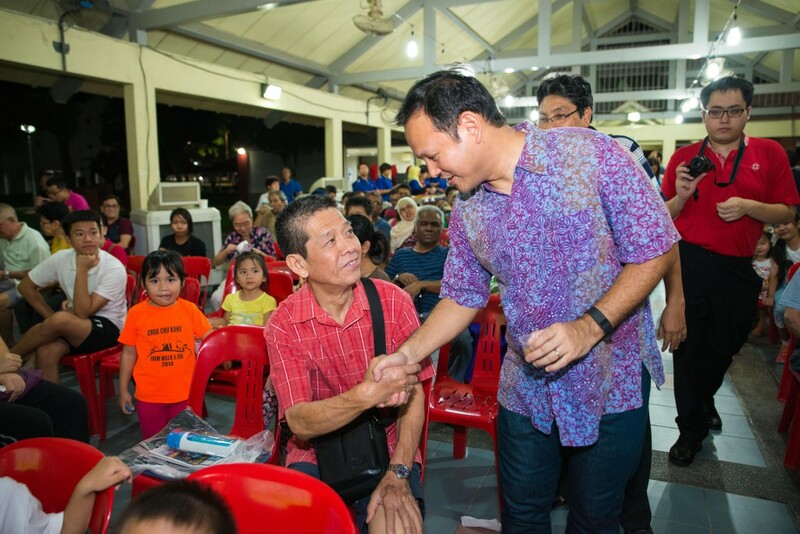 Together with MP for Chua Chu Kang GRC (Keat Hong), Mr Zaqy Mohamad, the residents spent an enjoyable evening mingling and making new friends at the event. 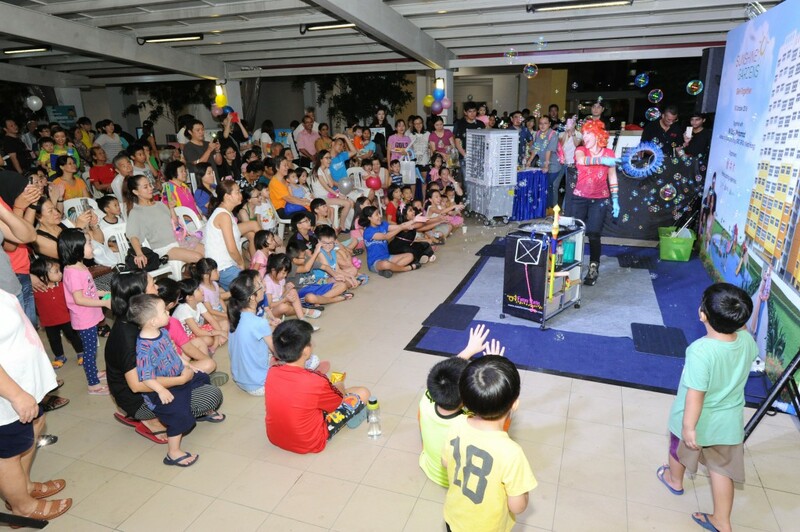 We are delighted to see our residents participating in the various game booths and children having lots of fun during the performances such as the creative bubble show. We look forward to seeing the residents again! Together, a better home for all. 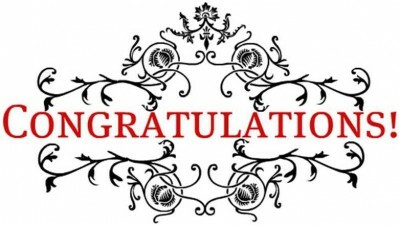 Congratulations to the winners of KEAT HONG 2020 – Special Edition Newsletter (We Love Feedback)! 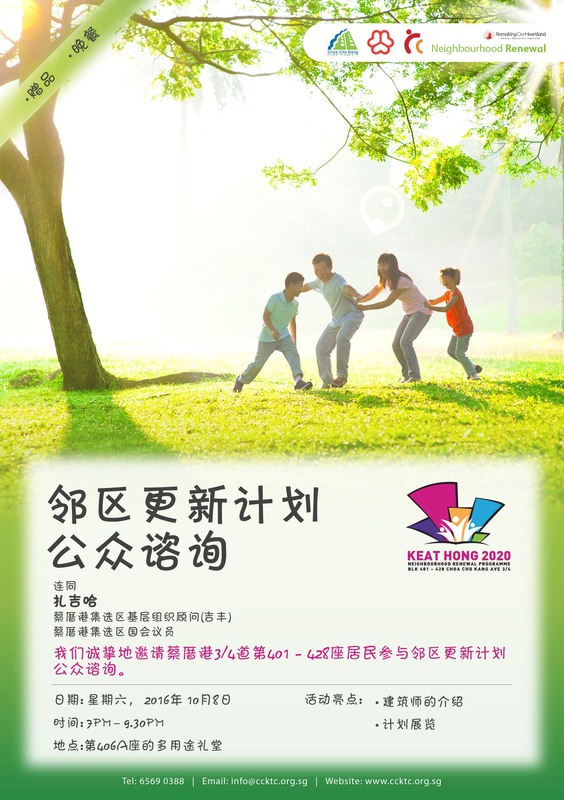 Thank you for the overwhelming response to KEAT HONG 2020 – Special Edition Newsletter (We Love Feedback)! Congratulations to our 5 lucky winners who will be walking away with a goodie bag worth up to $50! 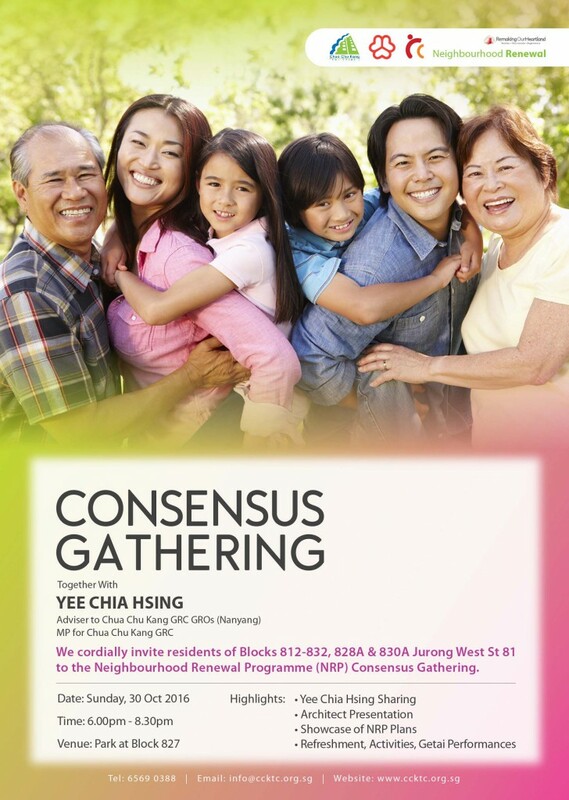 We cordially invite the residents of Blocks 812 – 832, 828A & 830A Jurong West St 81 to join us at the Neighbourhood Renewal Programme (NRP) Consensus Gathering on Sunday, 30 October 2016, 6pm at the park located near Block 827. We have completed our Public Consultation held in July earlier this year. During the Public Consultation, we are elated with the residents’ strong support and suggestions on how we can further improve the NRP. The NRP can only proceed if at least 75% of the eligible lessees in this precinct is in favour of it. 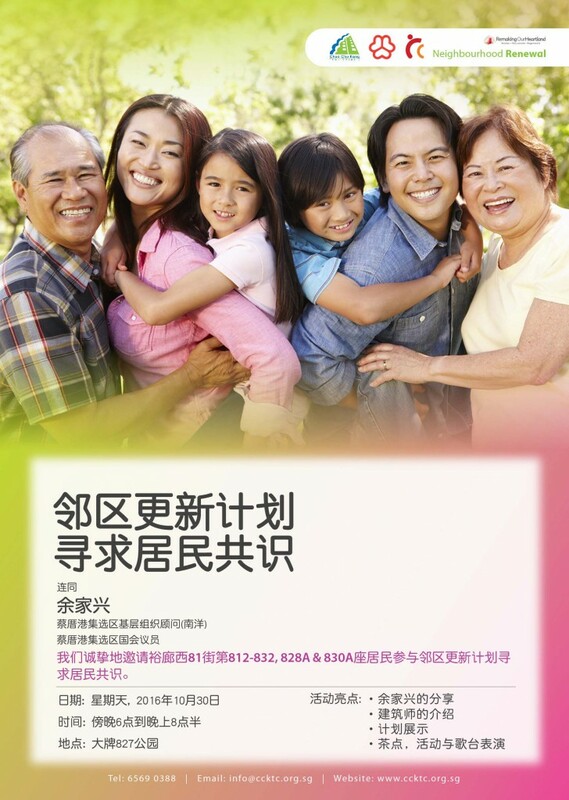 Thus, we hope that all residents can support the NRP during the NRP Consensus Gathering! 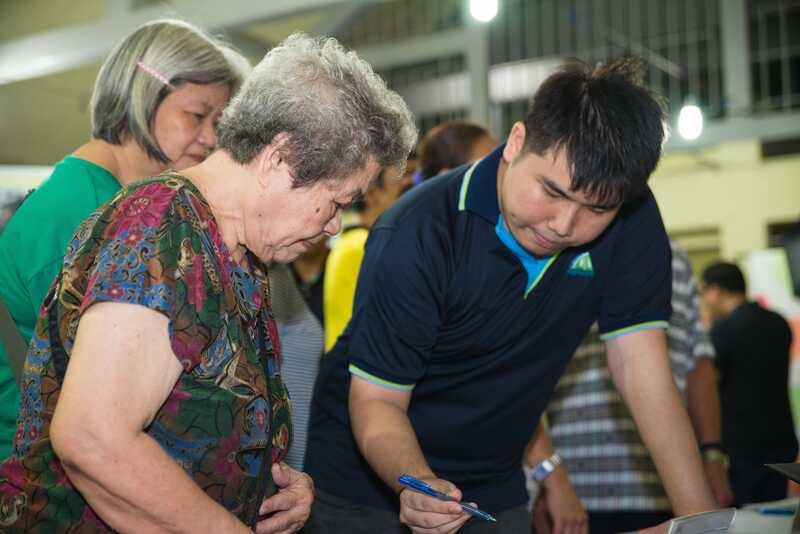 Over 200 residents from Blocks 401-428 Choa Chu Kang Ave 3/4 attended the Neighbourhood Renewal Programme (NRP) Public Consultation on Saturday, 8 October 2016. 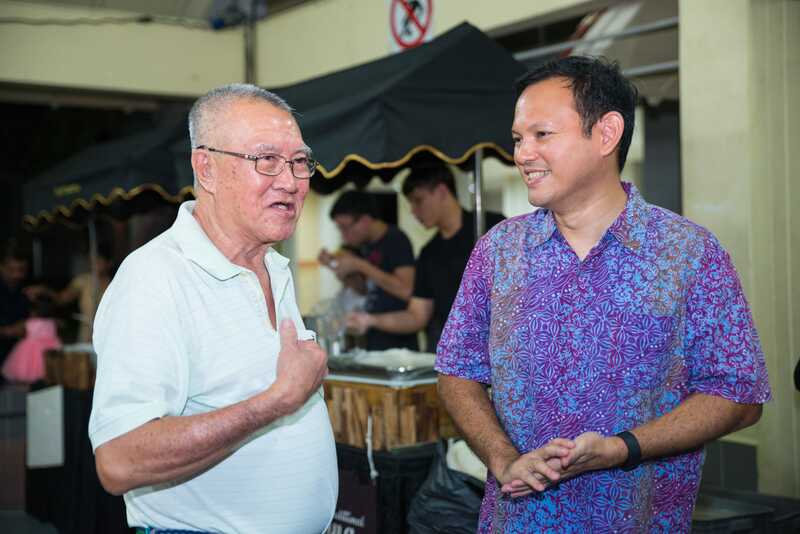 During the event, MP for Chua Chu Kang GRC (Keat Hong), Mr Zaqy Mohamad shared with the residents about the progress and highlights of the NRP. They are also encouraged to express their views and suggestions on how to further enhance the NRP plans during the Q&A session. 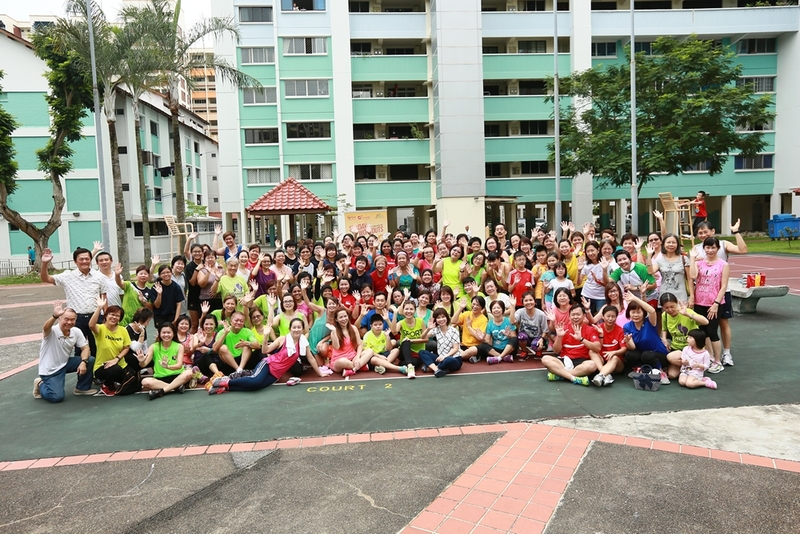 We are glad that our residents enjoyed the traditional refreshments, such as laksa, ice kachang, malt candy, and muah chee, which we have specially prepared for the event. We are also elated to see our residents’ strong support for the NRP. 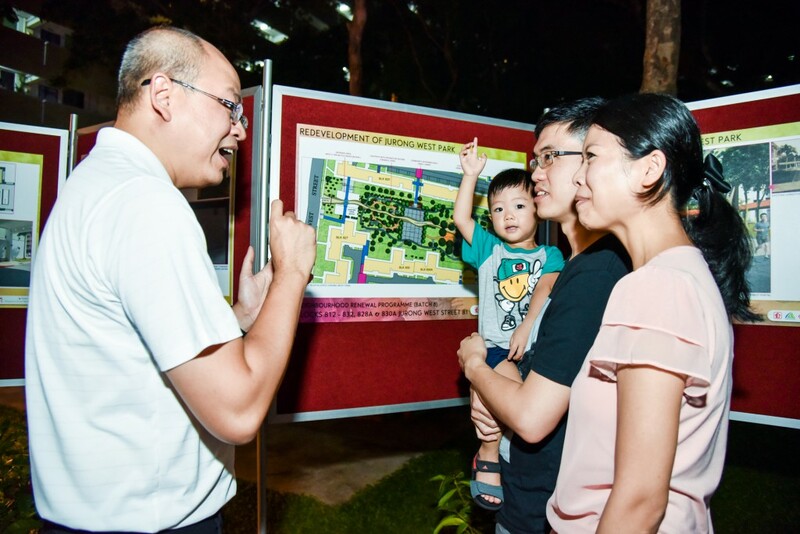 For residents who were unable to attend the Public Consultation, you may still send your support or feedback to the Town Council by emailing to info@ccktc.org.sg. We look forward to seeing you again early next year for the Consensus Gathering, where the final NRP plans will be showcased. 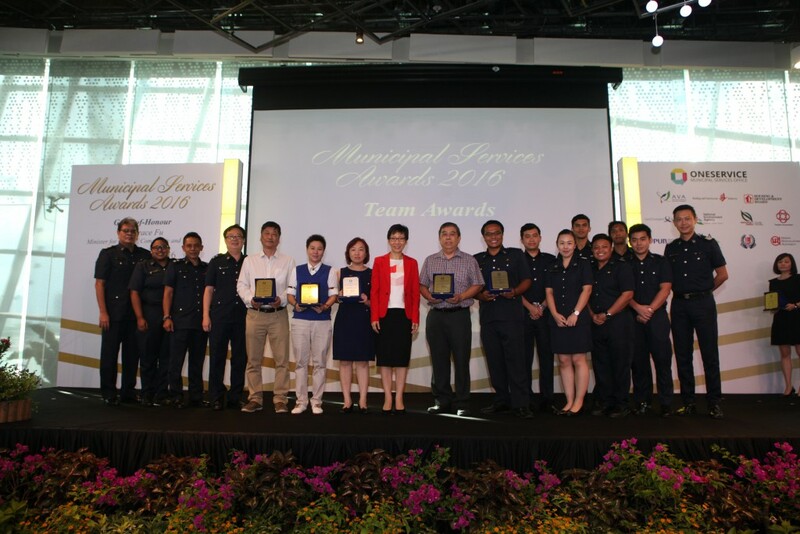 We wish to congratulate our Deputy General Manager, Mr Ang Chuan Seng and Senior Property Manager, Ms Winnie Chow for receiving an award at the Municipal Services Awards Ceremony 2016! The purpose of the Municipal Services Awards is to recognise the efforts in going the extra mile and the teamwork amongst agencies, to resolve municipal issues in a citizen-centric manner for our residents. 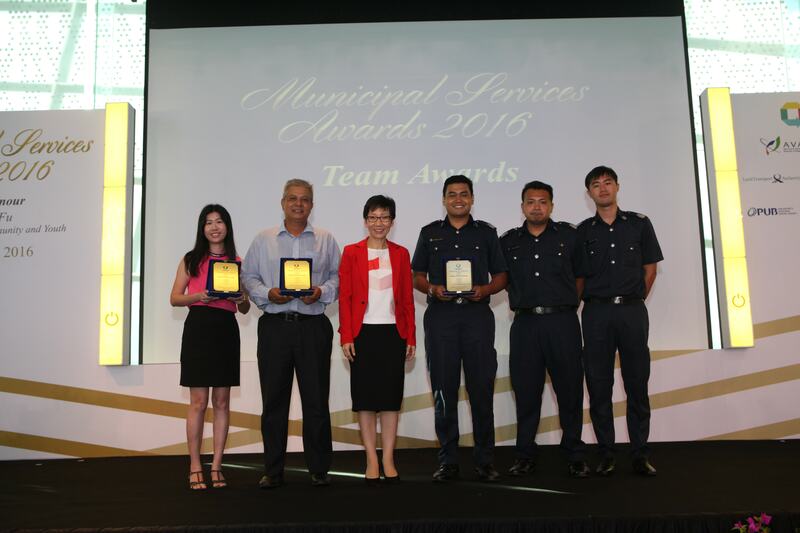 For more information on Municipal Services Awards Ceremony 2016, please visit the Municipal Services Office website. We wish to inform you that the current iTown@SG App does not support iOS 10. Rest assured, our vendors are working to update the app as soon as possible to ensure that iOS 10 users will be able to use iTown@SG. Update on 10 November 2016: The latest version of the iTown@SG App has been released and now supports iOS 10. Two residents at Blk 484D Choa Chu Kang Ave 5, have reported rat sightings in their units recently. 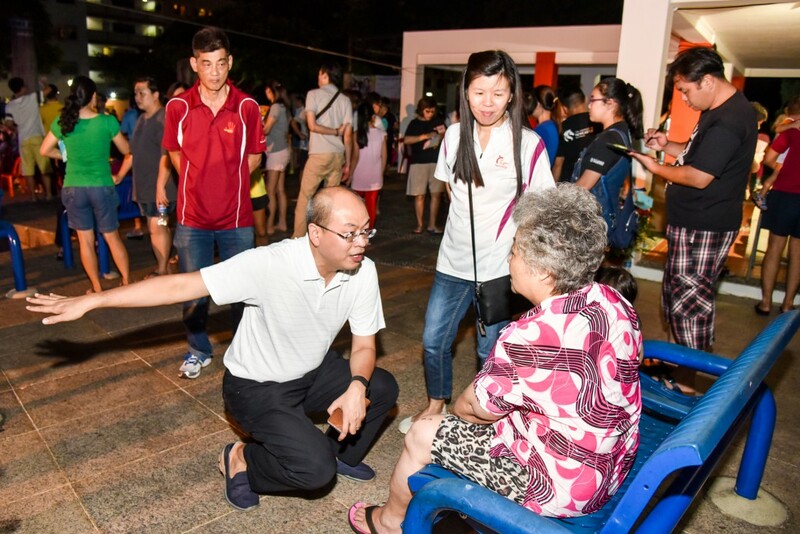 After investigation, we have deployed rat traps in the common areas near the affected units, and visited residents in the block to find out if they have encountered any rat issues and their concerns. So far no rats have been caught in the traps. We are pleased to inform you that since the start of September, we have further enhanced our rat control measure. Our pest control specialist has been carrying out an intensive rat eradication program to keep the rat problem at bay in our Town. 1. Weekly treatment and rat culling. 2. Regular inspections and cleaning of the estates, particularly where rats are attracted to – lift shafts, CRC (central refuse chutes), rooftops, store rooms and pump rooms. 3. Replaced damaged plastic gully trap covers in the bin chutes with metal covers, thus preventing rats from gnawing through them and getting to the refuse. 4. Removed dense vegetation at the jogging track for easier burrow detection, but none has been found. 5. Activated NParks and PUB to do inspection to ensure that rats are not coming from the drains and forested areas. Posters on rat prevention have been put up around the estates, and flyers will be distributed around our Town to educate residents on how to prevent rat infestation in their premises. This includes maintaining proper housekeeping and not leaving food sources exposed. 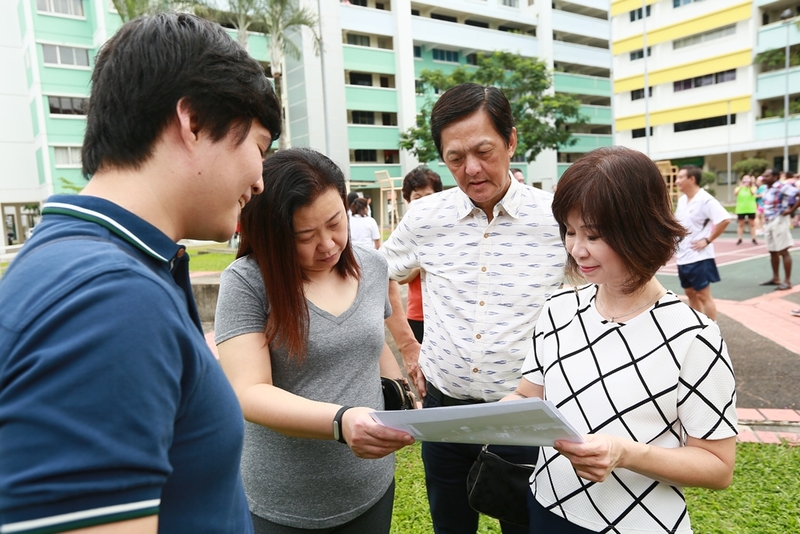 Together with our Residents’ Committees and grassroots leaders, our property staff will be conducting house visits to residents to get their feedback and see how we can help them. 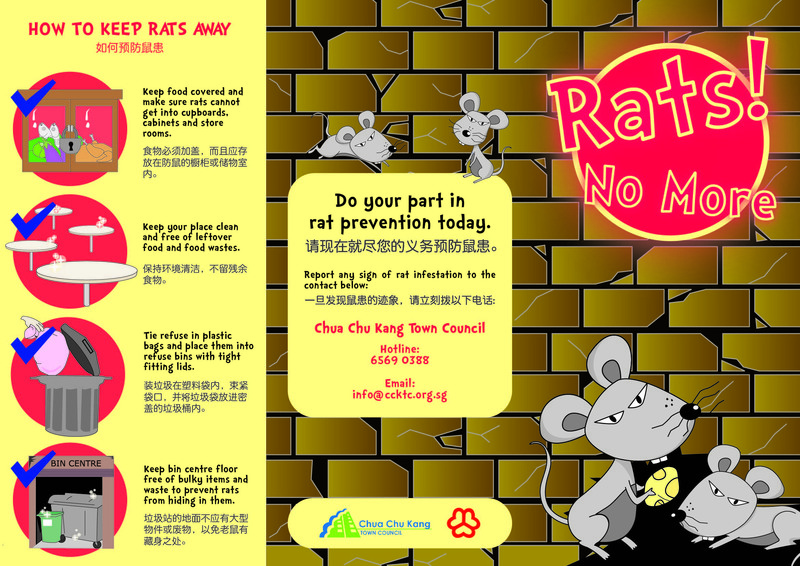 Residents can call 6569 0388 or email info@ccktc.org.sg if you spot rats. Let’s all work together to make our homes safe and free from rats! 4 Steps to Stamp Out Rats! 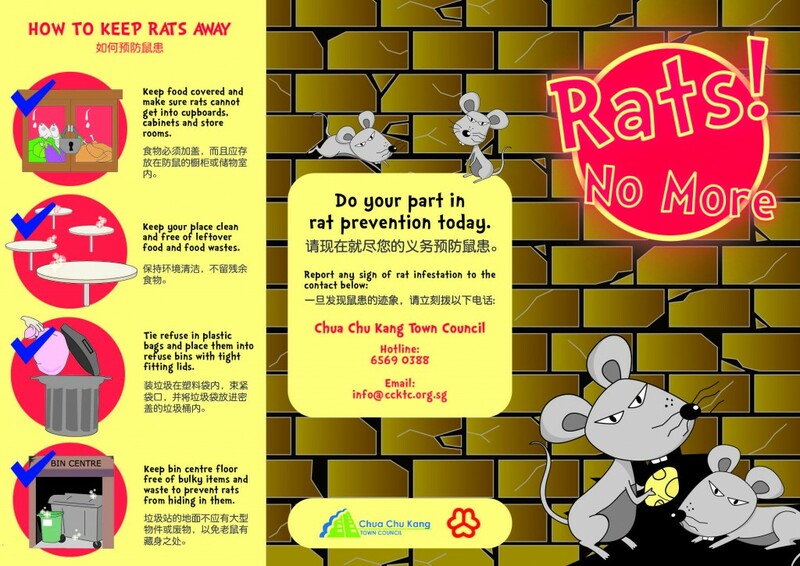 Call Chua Chu Kang Town Council at 6569 0388 or email info@ccktc.org.sg if you spot rats. We cordially invite the residents of Block 401 – 428 Choa Chu Kang Ave 3/4 to join us at the Neighbourhood Renewal Programme (NRP) Public Consultation! The precinct will see improvements to the common areas through the renewal and provision of additional facilities with the Government’s fully-funded NRP. We have completed our initial round of Sharing Sessions, held from April to May earlier this year. 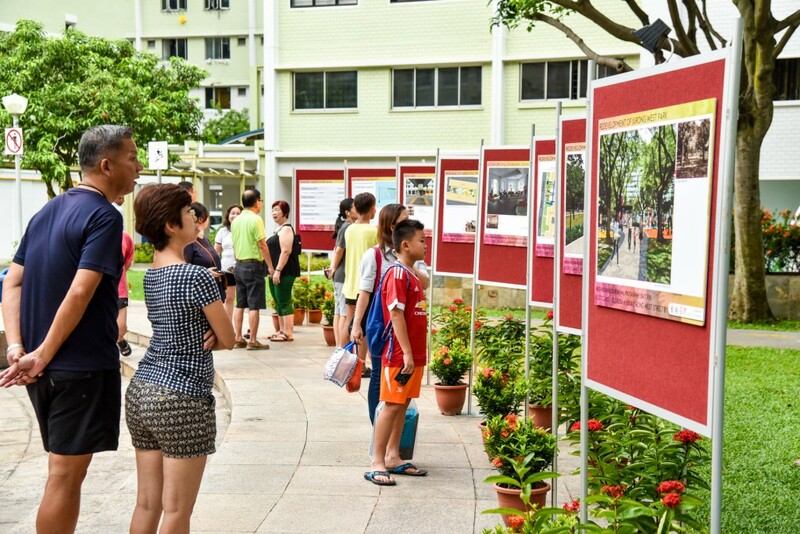 The revised NRP plans, incorporated with residents’ suggestions gathered during the Sharing Sessions, will be revealed through the Public Consultation. The NRP will only be implemented if at least 75% of the eligible lessees in this neighbourhood support it. Thus, we look forward to your active participation and support for the NRP! 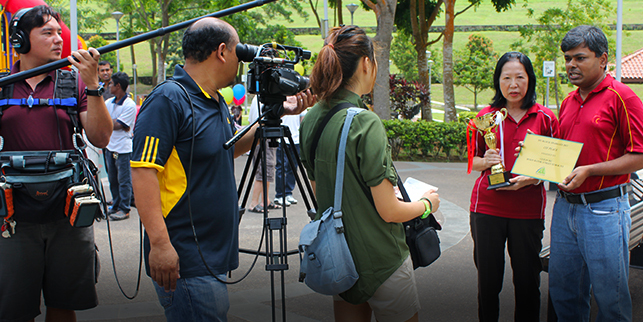 First and foremost, we would like to welcome our Keat Hong Mirage residents to Chua Chu Kang Town! 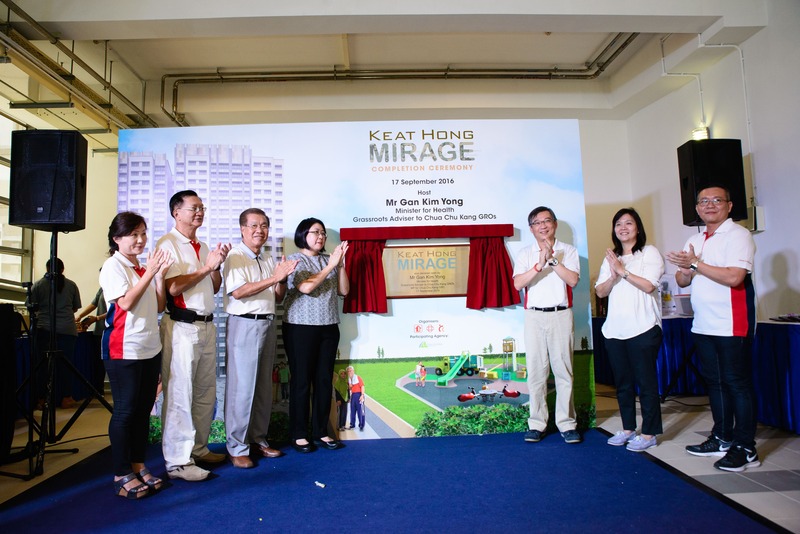 Over 250 residents from Keat Hong Mirage attended the Keat Hong Mirage Completion Ceremony on Saturday, 17 September 2016. Together with Minister for Health and MP for Chua Chu Kang GRC (Chua Chu Kang), Mr Gan Kim Yong, the residents excitedly toured the newly built neighbourhood. 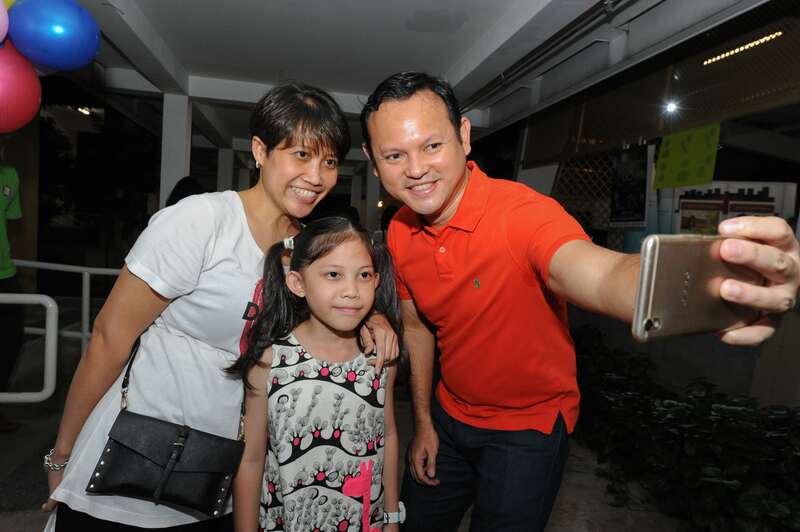 Some of the residents also collected the keys to their new home during the event. 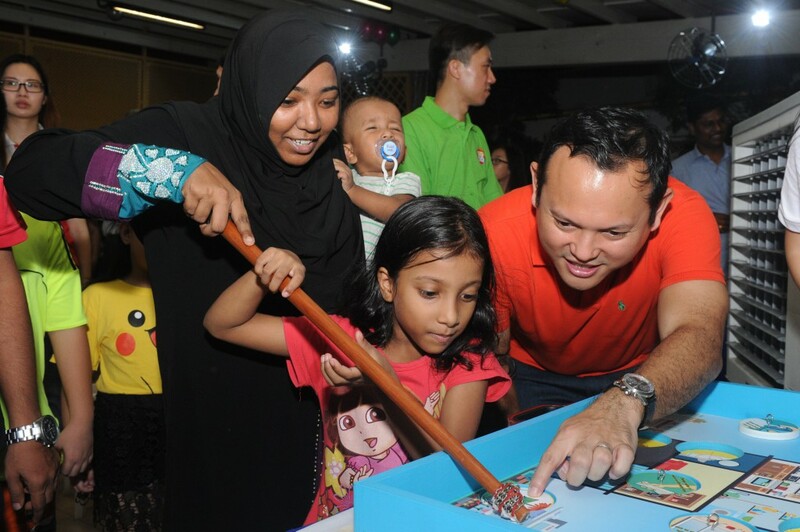 We are glad to see our residents mingling and enjoying themselves at the event; especially the joyful children during the magic show and creative bubble performance. We look forward to seeing the residents again!